If you're moving out on your own for the first time, this bed-in-a-bag includes everything you need to outfit your Twin XL bed. In trendy modern colors, this set includes a comforter, sham, flat sheet, fitted sheet, pillowcase, and even a laundry hamper to meet all your bedding needs. Wow fits the bed to the tee, and I love the color. Fits dorm room beds perfectly. Easy to wash, strong, well made. Nice sheets. my daughter had been looking everywhere for a bed in bag to take to college with her. I introduced her to this site and within minutes she found this set. Needless to say it was exactly what she was looking for. She told me it looks perfect and its extremely comfortable. It is a sad time of the year when you truly find out how many children are in need. This was a great economical gift to purchase for a child that is part of our Christmas Assistance Program. This is nice and functional. Appreciate the bag that comes with it. This set was ordered for my grandson to take to college. He loved it! 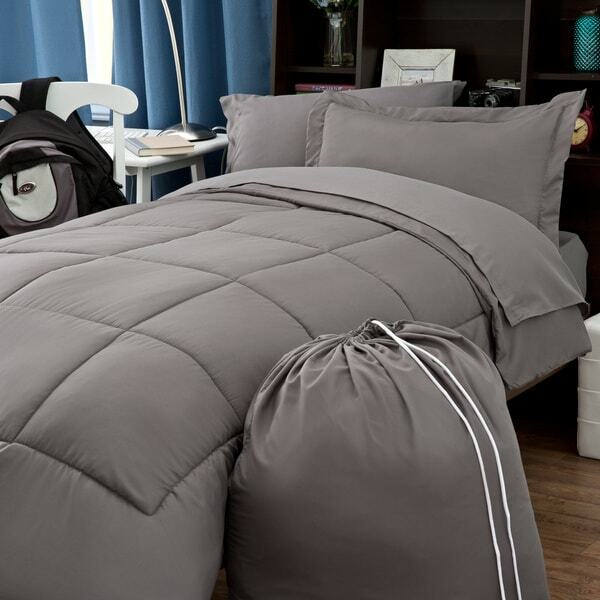 GREAT VALU,.WELL MADE, HARD TO FIND SIZE.I GOT THIS FOR MY GRANDSON FOR COLLEGE WILL PURCHASE ANOTHER SOON..
Great for college student staying in dorm. Really good quality for the price! I volunteered to help purchase some items that are provided to children in need for the McKinley School Christmas program. This bedding will be wrapped and given to a child in need that asked for bedding on their wish list. Roughly a third of your life is spent in bed, so choosing the most comfortable sheets is kind of a big deal. But with so many bed sheet types to choose from, how do you pick the best bedding for you? We’ve compared all the different types of sheets, looking at key factors like price and temperature control, so you can be confident in the quality of the sheets you bring home.